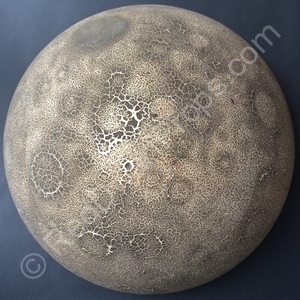 A visual effects model (VFX) moon miniature screen used in Series VII. 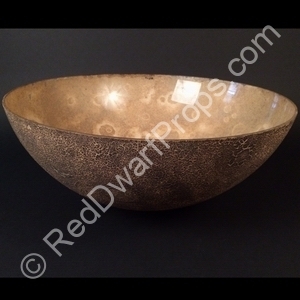 This prop measures 2 feet in diameter, it is by far the largest prop in my collection, and presented quite a challenge of how to display it. 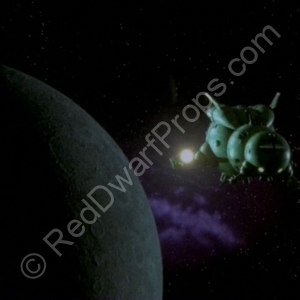 So how did the BBC VFX team make this visual effects model? 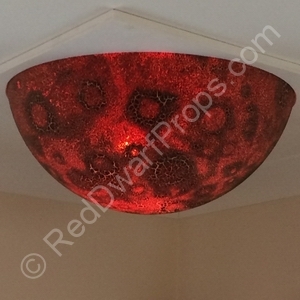 The dome is made out of acrylic (approx 5mm thick) and measures 24″ in diameter. The cratering effect was achieved by stippling latex on to the acrylic, which would then shrink when dried to create a textured effect. Placing a back-light behind the dome can then create some quite amazing effects. So how was it used? Well, the dome doesn’t have any holes or obvious signs of being suspended by wire. However inside there is what looks like duct tape residue. So I suspect in typical BBC fashion, duct tape and a broom handle of sorts featured in this setup. 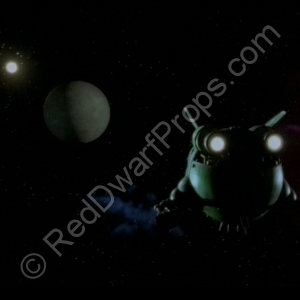 The latter series of Red Dwarf has often been criticised for over-embracing CGI in favour of the fan friendly real life props, models and visual effects. 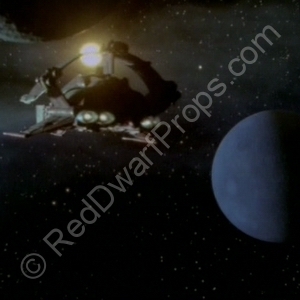 Limited budget and wobbly sets are part of why we love Red Dwarf, and I sincerely hope the team go back to basics with the new Series. Below you can see some test shots of the moon in action, although to my knowledge these scenes didn’t make the cut. 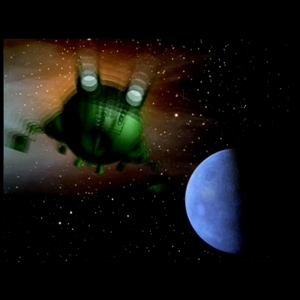 Although the shots above didn’t make the cut, the visual effects model moon does make the final cut in the episode “Stoke me a Clipper” where it can be seen coloured blue in the bottom right of the screen. 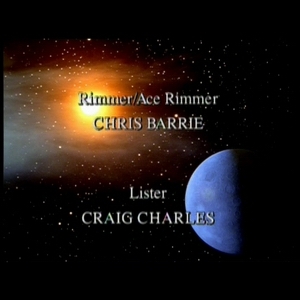 This shot of the end credits and also of Ace’s ship can be matched perfectly to this moon, however the blue colour was either some clever light filters or enhancement with CGI. I decided to avoid the duct tape & broom handle, and instead opted for mounting the moon on the ceiling. It sits in a cradle, that allows it to be suspended by its own weight. 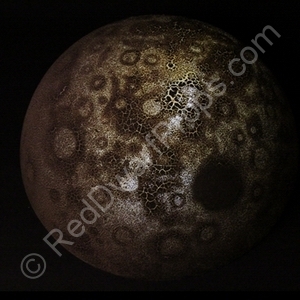 I also attached a remote control multi-colour LED bulb behind the moon, allowing for some quite amazing effects, that especially come to life in complete darkness. 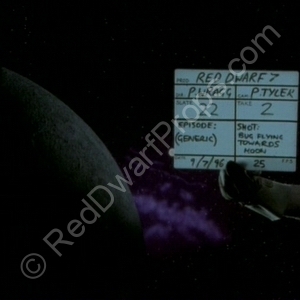 Tagged 1997, Series VII, Stoke Me a Clipper, VFX. Bookmark the permalink. This website is a non-commercial fan site, and is not affiliated with, or in any way associated with Grant Naylor Productions. 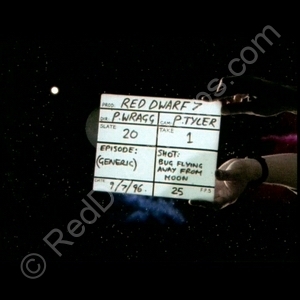 Red Dwarf props | Powered by Mantra & WordPress.